I’m always impressed by the amount of work that goes into creating a successful cover. Angela Roquet is here today to talk about the making of her covers. 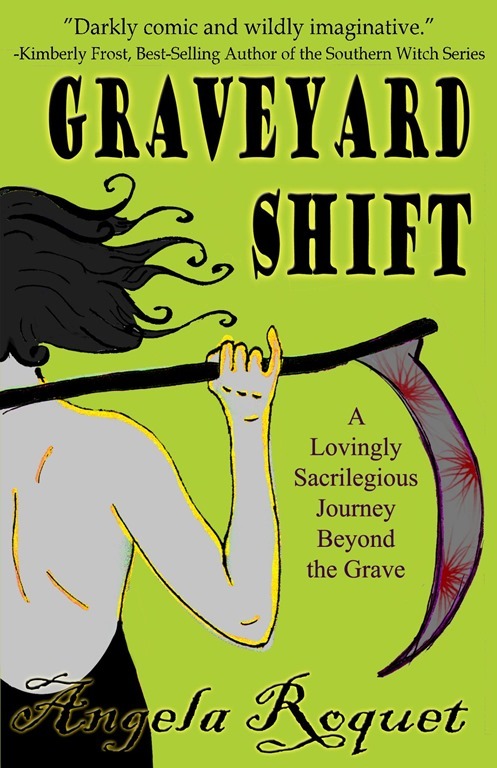 For a chance to win her urban fantasy novel Graveyard Shift enter the great Indie Giveaway. I still have a day job as a graphic designer, so that experience came in handy when I designed my covers. Of course, the covers I usually design are for real estate guide books. I used photoshop for all of them, and I decided from the beginning that I wanted to use really vibrant, bright colors to draw the eye. The first cover is green, and the image is one that I drew by hand and scanned in. It’s a picture of Lana, my main character, from the backside, holding her scythe over her shoulder. I sharpened the image in photoshop and injected some color. Then I used a few fun yet legible fonts to add the title and my name. I used some beveling and shadowing features to enhance the text. I used a more basic font for the cover blurb and subtext. The cover for book two is purple. I took a photo of a boot and applied some artist brush effects to make it look more like a cartoon, and I used the same special brush tool to add the red blood splotches that I used on the scythe for the first book cover. I threw a few daisies in the background to tie-in with the title. 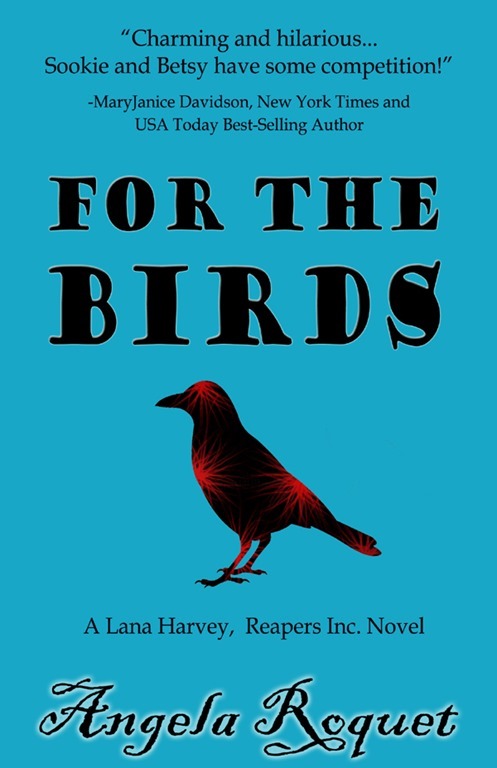 The third book cover is a sky blue. I used the silhouette of a crow and added the red blood splotches again. I really like how it turned out. I think keeping it bold and simple is key when it comes to covers. 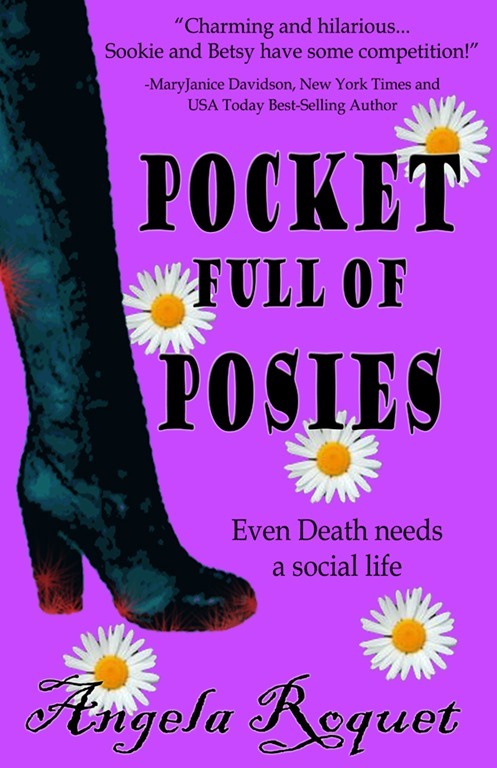 Angela’s first two novels GRAVEYARD SHIFT & POCKET FULL OF POSIES are now available in select stores and on Amazon.com in print and for the Kindle!